Europe’s premier basketball club competition, EuroLeague Basketball, is taking the courtside experience to the streets of five major European destinations, following the launch of a five-week roadshow tour across Spain and Germany. 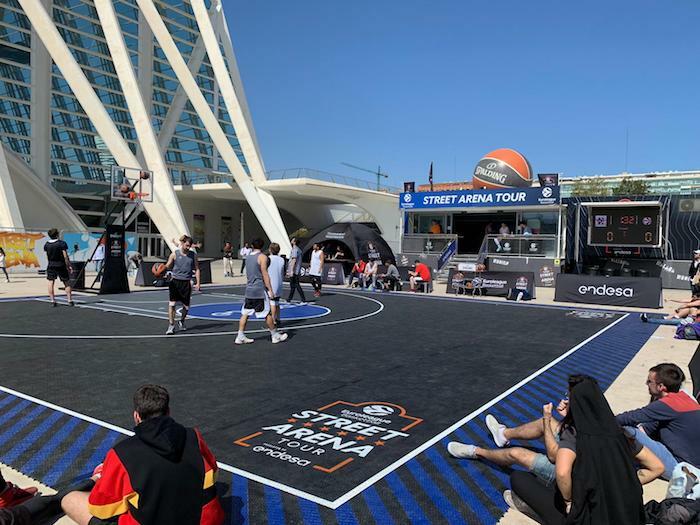 Partnering with global roadshow experts Event Marketing Solutions (EMS) and experiential marketing agency IMG Live, the tour launched in Valencia last weekend in the build-up to European basketball’s crowning event – the Euroleague Final Four. Taking place in Vitoria Gasteiz, capital of Spain’s Basque region, the three-day long competition sees Europe’s top four basketball teams battle it out to determine who will be crowned continental champions. Designed and managed by EMS, the tour is set to make further stops throughout April in Malaga, Madrid, Barcelona and Munich, spending two days at each destination. Features of the event include a bespoke Euroleague court, merchandising area, DJ decks and unique LED screen to display game scores and fixtures. In addition, each city will have its own street art wall, spray painted by a local artist on each city visit. Visitors’ sporting prowess will be put to the test with a host of interactive activities, such as games designed to challenge dribbling reaction speeds and vertical jumping abilities. Across each day of the event day there will also be rolling tournaments of 3×3 matches, with the eventual winners crowned the King or Queens of their respective cities. Commenting on the tour, Keith Austin, CEO of EMS, said: “Often billed as the Champions League of basketball, there’s a great sense of anticipation building around this year’s Final Four, particularly amongst existing fans. With this tour, there is great opportunity to spread the excitement and engage a whole new generation of fans. “We’ve seen just how this approach can pay dividends for sports, by setting up in the heart of their communities, many younger fans are given their first real chance to engage with the sport forming their own personal connection to the league and its teams.